candles, flashlights, story books, shadow puppets and giggles! 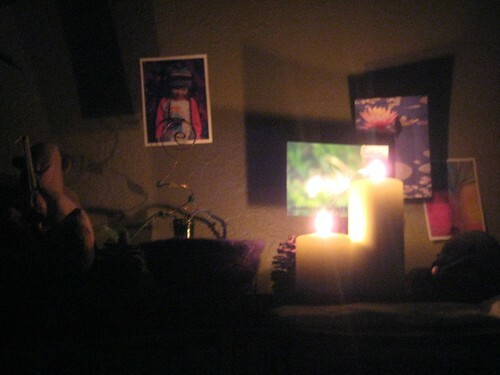 earth hour 2010 was a very good time. daddy had to work so it was just myself and the littles. esme loves the dark, harper had to be convinced. and, just like last year, we decided an in the dark earth hour interview was in order. apparently sitting in a dark with a flashlight for an hour makes esme a wee bit silly. normally she does not speak in a creepy redrum-shining voice... perhaps she was trying to set the mood. who knows! yesterday morning while getting esme' ready for school i discovered this little note on top of her neatly folded clothes that she had picked out the evening before. her "sk8r" outfit was a pair of dark denim skinny jeans and a pink pullover sweatshirt with brown hearts. i am not a morning person. this was an undeniably happy way to begin the day. yes, esme' is awesome indeed! ahhh, could it be... SPRING!! spring is here and i couldn't be more ready for it! we are busily and happily spring cleaning (with a bit of nesting thrown in, perhaps) and garden planning. the windows are open, the sun is shining, we are playing outside and coming in with dirt under our finger nails and smiles on our faces. we have been bringing out seasonal decorations and assembling our spring nature table. this afternoon we set out our felted bird's nest and eggs. i have been browsing etsy looking for little wood trees and woodland creatures to add to our display. 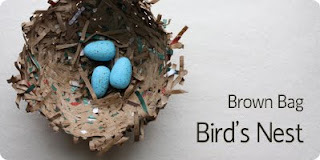 create a nesting station for our feathered friends. 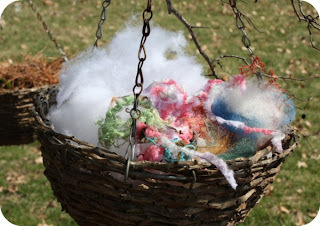 we do this every year and i am always hoping to spot a colorful nest in our trees with bits of yarn and woolly fluff sticking out. start a wormery! nothin' like the close up investigation of our earthworm garden friends to celebrate the season! during our recent weekend get away we drove by this sweet little sheep farm. it is beautiful, nestled in the canyon right next to the river. 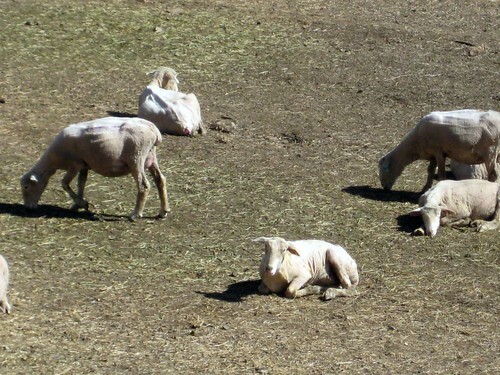 all of the sheep were freshly naked of their fleece. i couldn't help but stop and say hello and take a few photos of them- and thank them for their woolly sacrifice, of course! 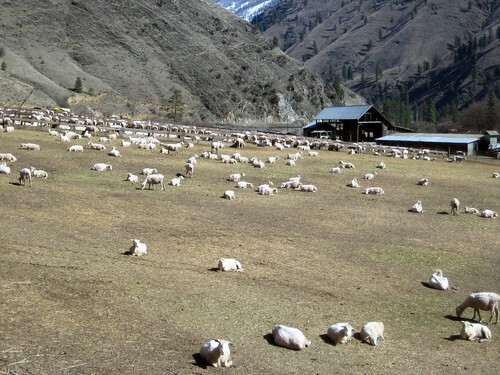 a few summers ago while we were camping right up the road the man who owns this farm herded his flock right through our campsite on their way to a nearby grazing spot. that is a pretty exciting event if you love sheep as i do. 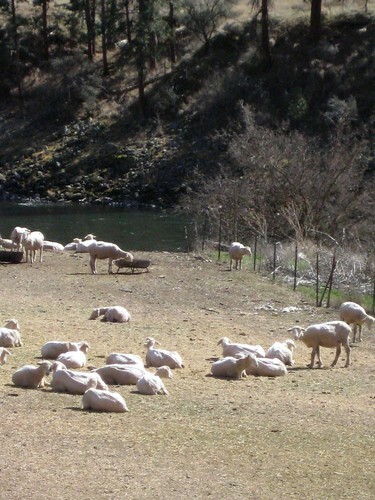 i am already day dreaming of a summer trip- tent camping, road side berry picking, river rock throwing, open fire cooking... and of course a friendly visit to the deep canyon, river side sheep farm. this weekend we took a brief but wonderful road trip. we stayed in a favorite lodge on our favorite river. we spent the days swimming, hot tub soaking, throwing rocks into the river and watching people catch fish, both big and small. the kids crafted fishing poles out of driftwood and string. the evenings were filled with board games, more swimming and soaking and hot cocoa and fresh cookies, compliments of the lodge. 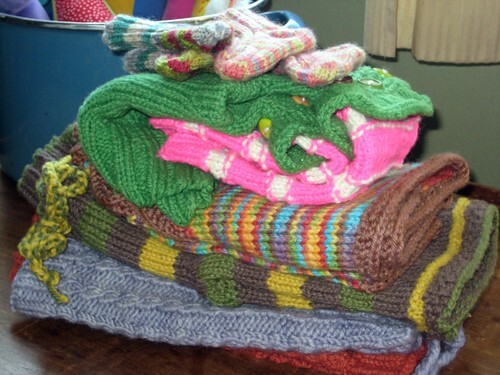 i spent a fair share of the weekend knitting and drinking tea. while we drove we spotted several deer and a beautiful red fox. we are home now, and home is a good place to be. home... made even better by mountain getaways and family fun! there is no place like right here, friends- happy monday! i write about stitches quite often here on my blog- knit stitches and sewn stitches... but this afternoon we experienced medical stitches... not so fun. 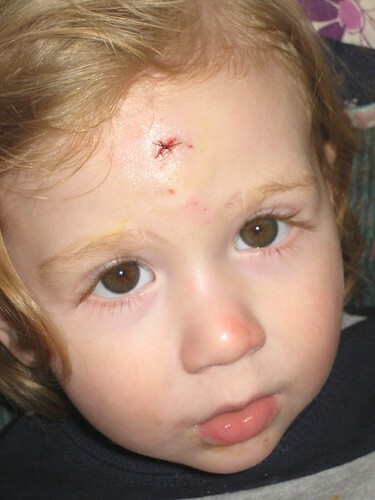 this was the classic tale of toddler + pavement = emergency room trip to put one little stitch in harper's forehead to keep the tiny but gaping gash closed so it can heal properly. 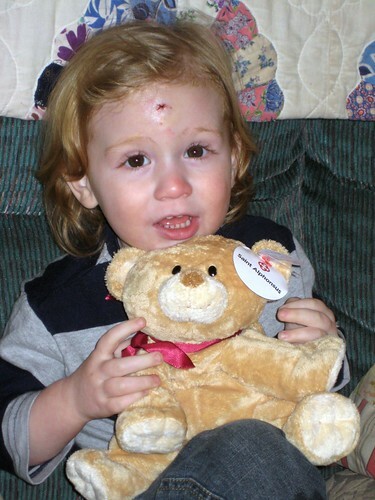 he was brave beyond belief and was given a special new friend, and a sucker, and many, many hugs and kisses and snuggles from every member of the family. i really did not want to knit this hat. normally i love creating handmade gifts for friends, and even for friends of friends. 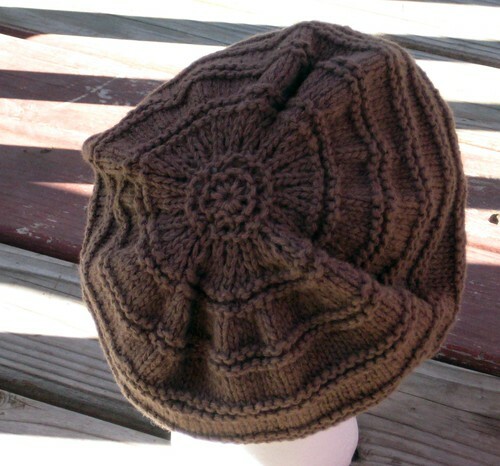 this hat was knit for a friend of my mom's. her best friend, in fact. her best friend who was recently and unexpectedly diagnosed with an aggressive form of leukemia. she went in for some tests on a thursday afternoon in february and was admitted to the hospital the next morning where she remains today. her chemotherapy was started two days after she was diagnosed and she began losing her hair a week later. someone kindly brought her some hats to wear but they all resembled ski hats- very plain and practical. my mom and i decided that she needed something cute and girly. 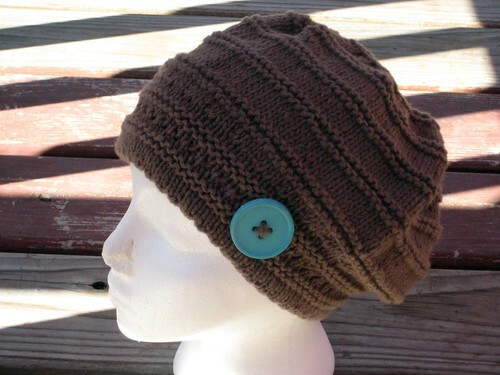 i knit the hat in a couple short days. 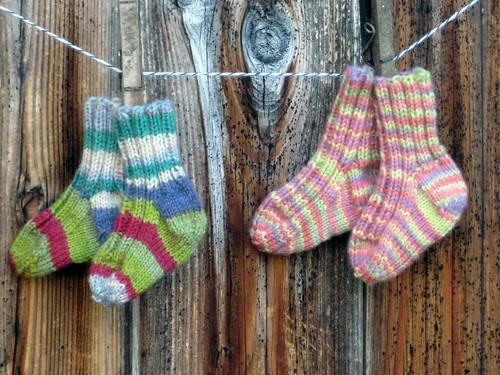 with each stitch i was reminded just how quickly things can change. how you can be living your life today and tomorrow have the rug pulled right out from under you. how precious every day, each moment really is. how lucky i am to have been able to pass on a special gift to a special friend in her time of need. today i am grateful for this hat and the reflection that accompanied it. lessons in living where you least expect them... this is life, friends. 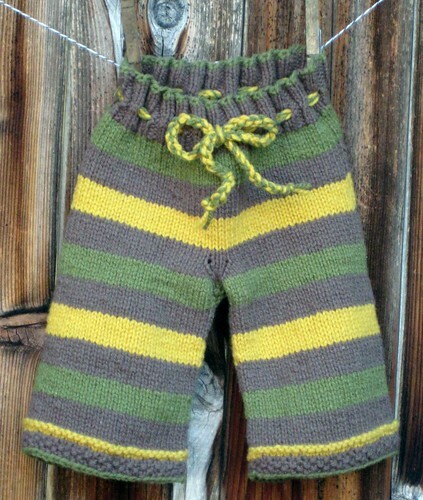 just a few little knits i have completed over the past weeks for our new baby on the way! 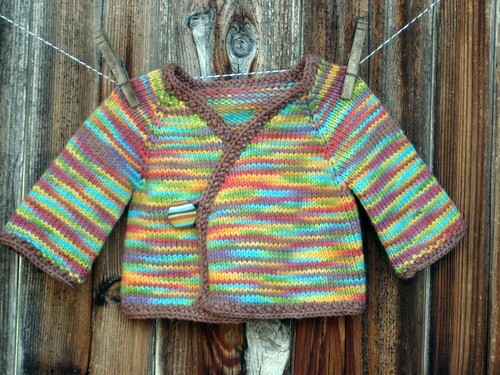 a little kimono knit with fluffy inspired mama organic merino in the earthy rainbow colorway. 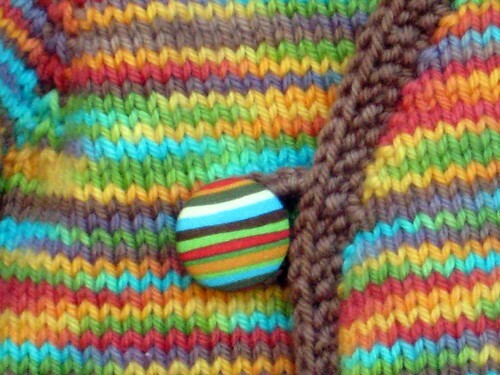 the little button was made from a scrap of the very fabric that inspired this colorway. 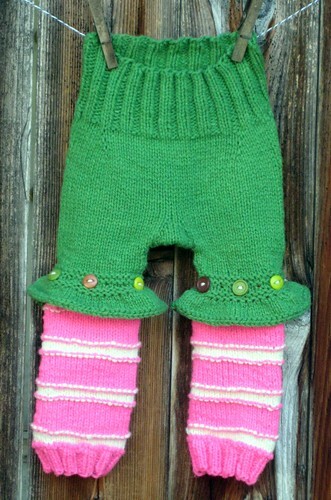 a pair super girly bloomers with leg warmers that button on and off. remember the "guarantee i have a boy shorts"? 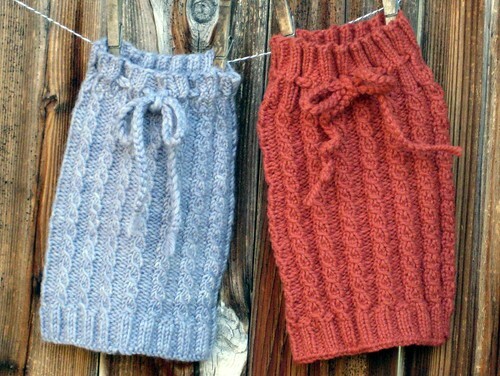 will this handknit bring the same results... we'll see! little faux cable sleep sacks knit from my own pattern. i hope you are having sunshine-y get outside and play weather in your neck of the woods too!